Any type of platform that can offer consumer insights is good for marketing and if you can access the tool easily, even better. 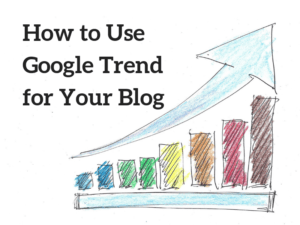 Today, I am going to show you how to use Google Trends not just for blogging, but also to enhance the understanding about your audience in real-time. Let’s see what type of interesting data it can tell us. As the leading search engine, Google has the capability to capture extensive data more than anyone else. From a business perspective, such data can reflect the consumer behavior and guide towards new opportunities by learning trend patterns. That’s where Google Trends come into the picture. It offers a visual comparison of traffic levels based on the user’s interest in a particular topic or product. While it doesn’t exactly show the traffic number like a keyword tool does, it reflects the relative amount of interest over time. 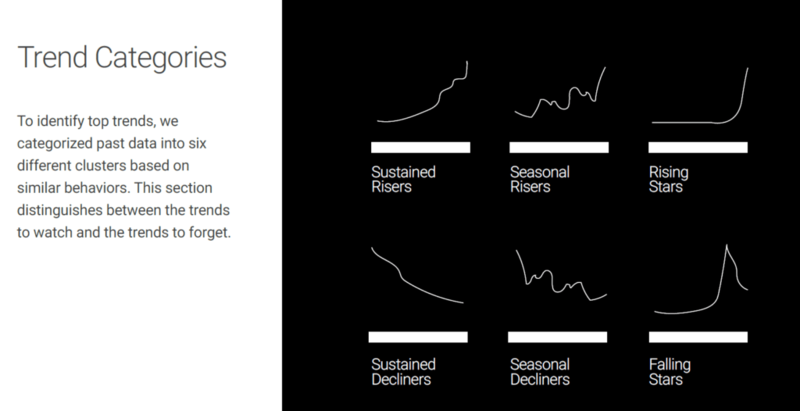 There are basically 7 types of categories that you would see with trend analysis and 6 of them are depicted below. The 7th one is the on-going trend which stays more or less in the same plateau over time. Businesses can leverage this data to target markets that ALREADY have demands based on certain industries or regions versus targeting a blind audience. It also shows related and rising queries for a given topic so that you can tap into new markets before others do. Google Trends offers so much value that advertising companies are now using it to predict a market’s profitability and sustainability. As such, this tool should be used for any online business who wants to break into a market trend. Local businesses can take advantage from the data to dominate a particular area, eCommerce can find out what type of products that sell more and affiliate marketers can select the best SEO keywords to target. If you run a blog of any kind, in which you should, combining popular trends WITH great content can accelerate your marketing strategy and help reach a wider audience in the online space. With that in mind, let’s see how we can use this data in more specific ways. For those who are new to starting an online business, the most commonly asked question is, what type of niche is profitable. While there are many resources to guide you, none of them is as visualized (and free) as Google Trends. Most people have a rough idea of what they are interested in and often times, it begins with a broad topic like food, sports or technology. In order to find a more specific niche and something that you like doing for the long term, it’s important to narrow things down and see what they look like in the real world. For this, use the Explore feature within the tool and enter up to 5 search terms (or sub niches) for comparison. 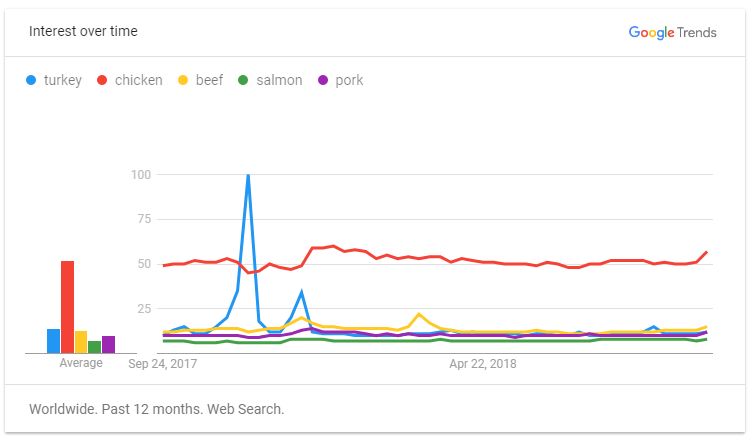 Say, if your interest is about the topic of meat related food, you can compare up to 5 subtopics and here’s what the trend patterns would look like. 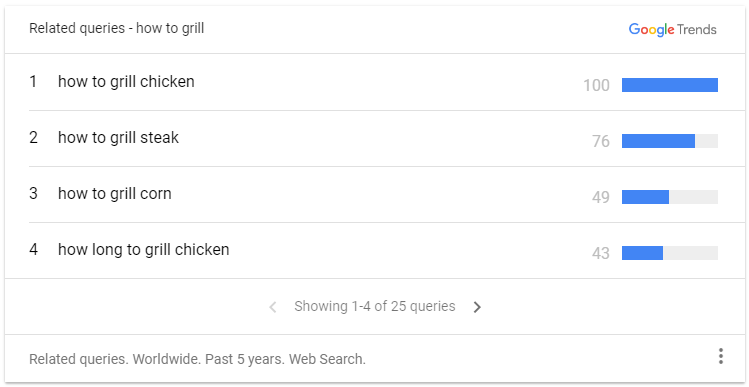 Clearly, chicken meat is far more popular, followed by beef and pork. This information tells us that the topic has more online searches and likely more profitable than others, but you also need to consider the amount of competition that’s involved. While other topics may look less popular, they are probably easier to enter the market as a new business owner. However, you may want to avoid something that’s unpopular as well, otherwise, it could take a long time to gain traction and make money. By studying such trends over time, you can thus evaluate their longevity, the pros and cons within a given market, before investing your time and money into the business. Once you’ve identified a suitable niche, the next step is to promote it through content and that’s where keyword research comes into play. Keywords are basically specific phrases that people use to search for information online and Google has the ability to capture this data into its system. This includes search terms for videos as well. The most common way to retrieve these keywords is through the auto-suggest feature, whereby related phrases are shown as you type into the search bar. This method is great for revealing specific keywords, but what if you only have a general idea? That’s where this tool is used to validate what you have in mind before you begin researching for keywords. 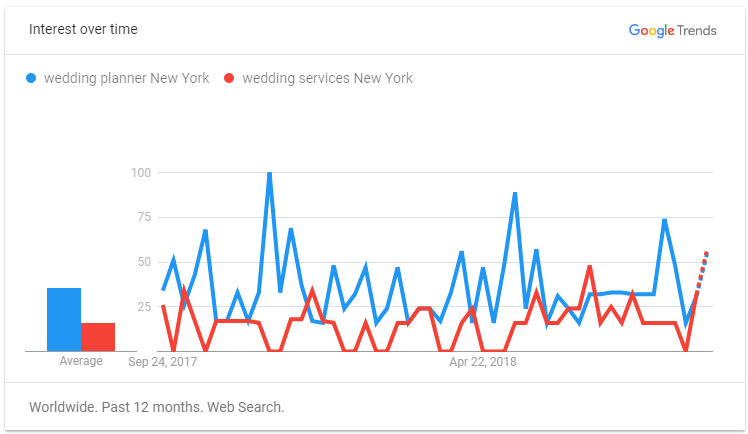 For example, for a local wedding business that is trying to rank on the local search, they are probably contemplating between the term ‘wedding planner New York’ or ‘wedding services New York’. In the trend patterns over the course of 5 years, the first one appears to be more searchable between the two so this would be a better term to optimize for the business homepage. 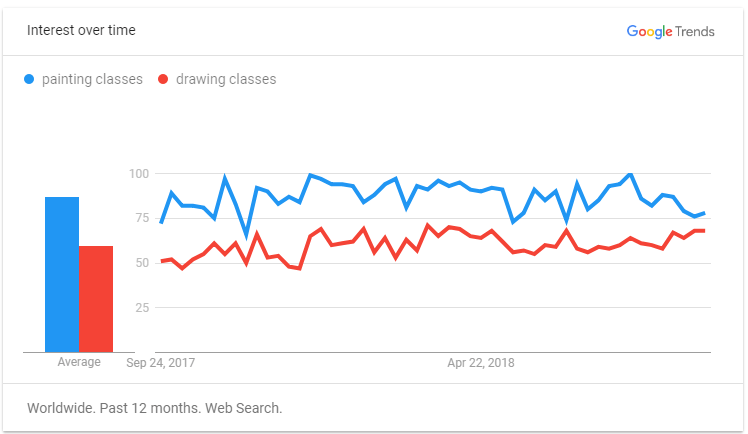 Likewise, if an art studio in the US is looking to promote their classes in certain regions, they may focus on the term ‘painting classes’ over ‘drawing classes’ in their blog activities as that seems to attract more audience. For an eCommerce blog, Google Trend can show what type of products are in demand versus those that are selling at a regular pace. 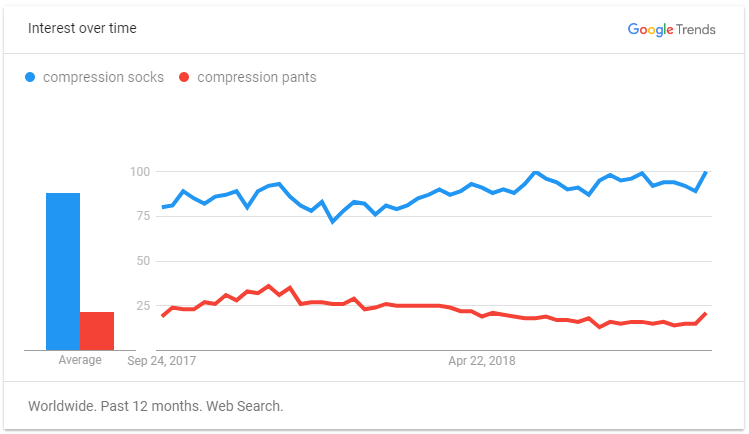 The comparison between ‘compression socks’ and ‘compression pants’ in the graph below is one such example. In addition, if you are thinking about running a promotion during shopping seasons, the tool will reveal the best time of the year to do so. 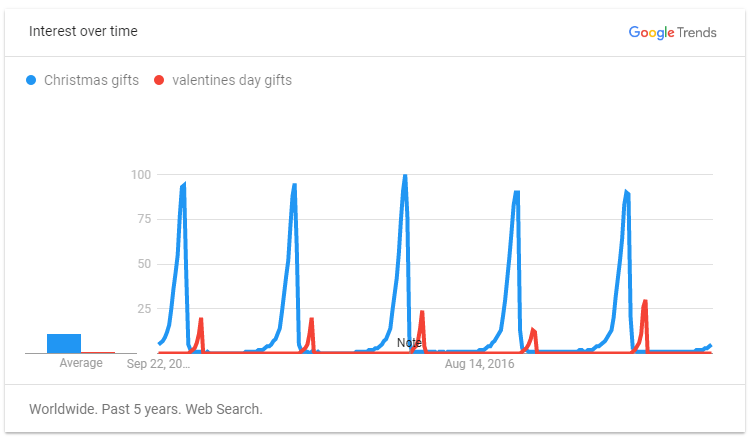 From the graph, we know that a lot of people search for Christmas gifts in December so this is probably one of the best months to offer your products at discounted prices. For affiliate marketers, leveraging from market trends is similar to finding a profitable product to review. 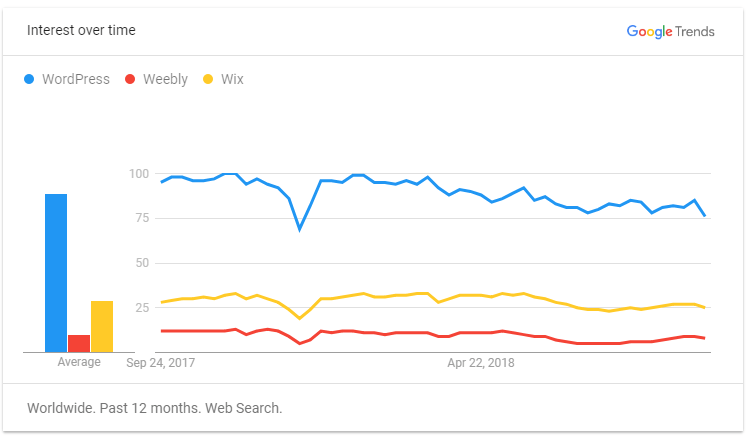 If your blog talks about website and hosting, then doing a comparison between WordPress, Weebly and Wix builder is a must because it will show you which platform is more widely use. And because we publish so regularly, we also need to plan our topic schedule in advance so that you can produce the right content at the right time. For example, if you run a food blog, it’s better to write ‘how to grill’ topics in the summer months and ‘how to bake’ topics in the winter months to keep people visiting your blog. To expand your blog topics, you can scroll down to the ‘Related Queries’ section for specific keyword ideas originating from your initial search term, that took place recently. For each term, Google offers up to 25 suggestions and these are new niche keywords that can be analyzed to see their ranking potentials. As you can see, graph trends are great references to add into your blog. It helps the audience to understand what you are researching about (just like what I am doing in this article with you) and it simplifies a topic in a graphical manner that most people would understand. Google knows the importance of this and that’s why they have added an embed feature for each graph section so that you can copy-and-paste the images into the HTML editor of your blog. Alternatively, you can also share the image link through your preferred social network. 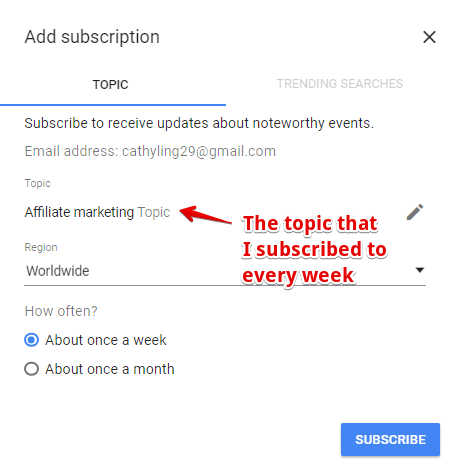 Lastly, if you want to keep yourself up-to-date with the happenings within your niche, there’s a subscription feature on the drop-down menu where you can select any topics and let Google notify you once a week or once a month. It’s pretty handy and saves you time in gathering information from all over the web. 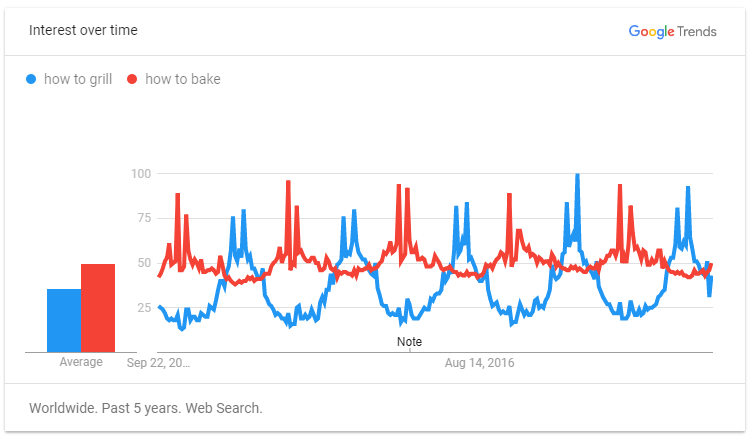 Have You Used Google Trend? If you haven’t, then it’s time to do so. I discovered its usefulness when I started blogging in 2014 and have been a huge fan of the tool ever since. The interface is very easy to use, the visual data are quite self explanatory and most importantly, it helps you make educated guesses about various marketing strategies based on actual trends and not assumptions. The more you learn how to use Google Trends coupled with good blogging content, the more visibility and better rankings you can achieve through the search engines. I hope you have found this short tutorial to be educational and if you need more help in growing a successful blog, check out some of the tips and tutorial on my recommended training platform here. Wow, I had no idea such a tool as Google Trends existed. But I am absolutely loving it. Will definitely have to get more familiar with it as in so far I’ve been more or less trying to guess the trends. Which has been not without much luck, but certainly tough. This will change the game for me. And save lots of time. Thank you for all the knowledge shared, it truly was insightful. Hey Matiss, glad you learned a thing or two from this. Thank you for sharing this useful tool. I think it helps a lot of newbies to have a good understanding about choosing their niche before diving all in. I am in the make money online niche and it can be challenging to gauge the consumer behaviors sometimes. Maybe this tool can give me some interesting insights. I was aware of Google Trend, but wasn’t really sure how to use it until I read your post. I’ve just started a new website for 2019 so knowing the features within this tool will help me with better and more interesting content creation I hope. Thank you for the walk through. Thank you for bringing Google Trend to my attention. I have never heard about it before until now. It seems like a powerful tool in finding the some popular and profitable niche market that we can capitalize as affiliate marketers. All the while, I’ve been depending on Google Alert for the latest news on the market, but from now, l will be using Google Trend as an additional guide in planning my online business direction. Great tip! This article is timely for me because I have just realized how useful Google Trends is. My blog suffered lately from a drop in traffic, and I thought about many different reasons for that. When I checked, I realized that there are not many searches in the Autumn and Winter because of the seasonal aspect of my blog’s main subject. That is relieving to know and does put things into perspective. Hi Sandy, that is often the case with seasonal niche, but don’t let that pull down the progress of your blog. Off seasons can be used to look for other opportunities, for example subscription based products to retain recurring commissions or work on improving the design and content of your blog.